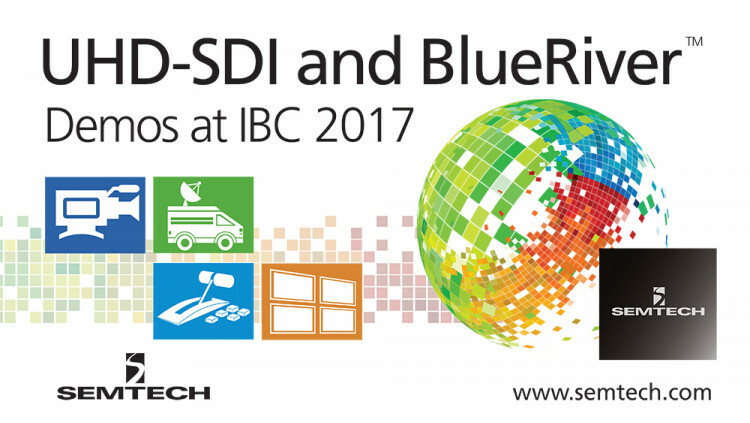 Semtech Corporation (Nasdaq: SMTC), a leading supplier of high performance analog and mixed-signal semiconductors and advanced algorithms, is exhibiting its extensive line of broadcast video UHD-SDI products and BlueRiver™ technology products at the IBC Expo 2017 in Amsterdam, September 14-19, Hall 8 at booth D41. With over 25 years of leadership in broadcast video semiconductor technology and standards, Semtech’s leading and comprehensive line of broadcast SDI products support all broadcast video data rates and formats. Semtech’s robust solutions enable extended reach, higher performance, interoperability with existing infrastructure, and strong signal integrity for next-generation Ultra-High Definition (UHD) TV Broadcast equipment. Semtech’s BlueRiver technology addresses the need for flexible software defined audiovisual (AV) that can be carried over low-cost IP networks without requiring compression or introducing latency. Software Defined Video over Ethernet (SDVoE™) is the only approach to AV-over-IP based on an interoperable ecosystem of Pro AV products and companies. BlueRiver technology is the underlying technology driving SDVoE applications and ecosystem. Demonstrations are by appointment only. Schedule a meeting here to discover more about Semtech’s broadcast video and Pro-AV solutions. • Learn about Semtech’s broadcast video platform: http://semtech.com/broadcast-video/. • Learn more about Semtech’s AptoVision Pro AV platform: http://www.semtech.com/aptovision/. Semtech’s UHD-SDI products feature ultra-low power consumption and provide industry-leading performance at 12Gbps rates. UHD-SDI is ideal for UHDTV infrastructures, including routers, cameras, monitors, switchers and more. UHD-SDI offers pristine image quality, is backwards compatible with existing SDI systems and is standardized by both the Society of Motion Picture and Television Engineers (SMPTE) and the International Telecommunication Union (ITU), simplifying UHDTV infrastructure upgrades and reducing risk for broadcasters. AptoVision’s award-winning BlueRiver™ technology has forever changed the dynamics of the Pro AV industry by letting installers and OEMs replace proprietary AV matrix switches with off-the-shelf Ethernet networks that deliver dramatically better price/performance, flexibility and scalability. Enabling end-to-end systems for AV and KVM signal extension, video wall and multi-view applications, BlueRiver chipsets offer zero-latency, uncompressed 4K streaming over standard IP networks and unique support for HDMI 2.0a and HDR. All statements contained herein that are not statements of historical fact, including statements that use the words “plans to,” “will,” “designed to,” or other similar words or expressions, that describe Semtech Corporation’s or its management’s future plans, objectives or goals are “forward-looking statements” and are made pursuant to the Safe-Harbor provisions of the Private Securities Litigation Reform Act of 1995, as amended. Such forward-looking statements involve known and unknown risks, uncertainties and other factors that could cause the actual results of Semtech Corporation to be materially different from the historical results and/or from any future results or outcomes expressed or implied by such forward-looking statements. Such factors are further addressed in Semtech Corporation’s annual and quarterly reports, and in other documents or reports, filed with the Securities and Exchange Commission (www.sec.gov) including, without limitation, information under the captions “Management’s Discussion and Analysis of Financial Condition and Results of Operations” and “Risk Factors.” Semtech Corporation assumes no obligation to update any forward-looking statements in order to reflect events or circumstances that may arise after the date of this release, except as required by law. Semtech and the Semtech logo are registered trademarks or service marks, and AptoVision and BlueRiver are trademarks or service marks, of Semtech Corporation or its affiliates.